Dreamy mode today. I know, maybe my system has slows down due to the lack of pressure from classes. But also, maybe it has something to do with the music I am listening to lately. I downloaded a 2 CD recording of classical guitar music by John Williams. And it is amazing. If only I had those hands, if only I had the dexterity to amaze people with the soothing and haunting sounds of the guitar. 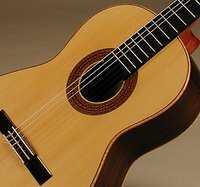 In his recording, entitled "The Ultimate Guitar Collection", the track I like the most is the Adagio from Concierto de Aranjuez, by Joaquin Rodrigo, a Spanish composer. This is his most famous work. Concerti are musical pieces where a solo instrument is pitted against the orchestra, highlighting the virtuoso capabilities of the solo instrument. The most common instruments to be used are the piano and violin, however, the Concierto de Aranjuez uses the guitar instead. There are very few concerti that are written for other instruments, and most of these pieces are written quite recently. On other things, I harvested quite some articles today. Yes, I went to the library and printed a dissertation and three other articles. These stack up to the articles to read this winter break. This brings me to a total of 2 dissertations, 6 articles, and 6 books. However, some of the books I do not need to read every word, just scan. Still, that is some work. Finally, I had a long-awaited haircut today. I hate having my hair grow long. If only I could go ahead and shave all my hair so I become a skinhead. But unfortunately, I have my mom to blame for not being able to do that. She did not position my body well during my sleep when I was still a baby. So that means that the back of my head is flat. And a skinhead look is bad. Grrr. I never liked a skinhead look! I have three CD's in my collection that feature Rodrigo's Concierto de Aranjuez. Another favorite is Tarrega's Recuerdos de la Alhambra. Cool classical guitar music!